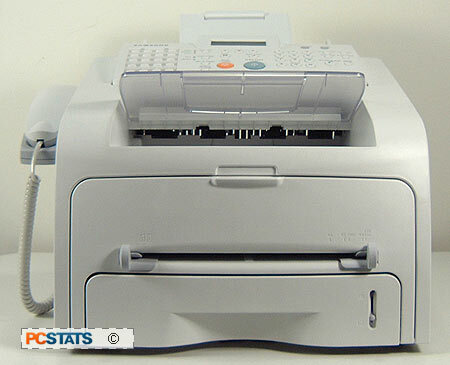 The Samsung SF-565P is rated at 17PPM with a warmup time of about 30 seconds and can hold 250 sheets total. Samsung recommends a monthly duty cycle of no more than 10,000 pages. The introductory toner cartridge that ships with the SF-565P is rated for about 1000 pages of standard black text at 5% coverage. Replacement cartridges cost about $75US (CAN$93) and last for 3000 pages. Power consumption is 300 Watts average when active, a rather glaring 85 Watts in standby and 10 Watts in 'sleep' mode. Like most laser printers these days, the Samsung SF-565P does not ship with a printer cable. Power and phone cables are included though, as well as the expected driver CD with PDF manual and a printed, poster-style quick installation sheet. It's footprint is about 16.5" x 15.5" and it measures just over ten inches tall. The SF-565P weighs a manageable 21lbs, and is easily movable by one person. The printer carries a one year warranty which does not include shipping or on-site service. Toll-free phone support is provided. The Samsung SF-565P has an imposing presence, due partly to it's brighter than normal off-white finish and mostly to it's fairly large size. It's not the prettiest of business machines, but it's purpose is instantly recognizable.On the control panel, a non-backlit monochrome LCD shows printer status info and the setup menus. The front of the SF-565P holds the assorted paper inputs and outputs including the 250-sheet main tray at the bottom and the manual feed slot just above it. The manual feed slot can accept a single piece of printable media at a time and uses a pair of plastic sliders to size the input. A plastic paper tray status meter is located on the bottom right of the main tray which will slowly move towards empty as you use up the paper in the tray. Above the two paper inputs are a pair of outputs for printed sheets and scanned/faxed sheets respectively. 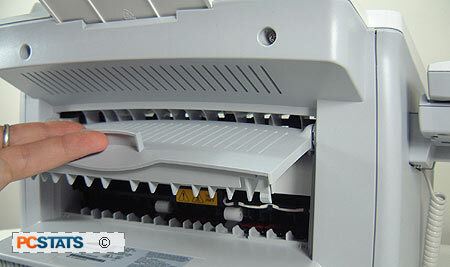 A plastic handle between the manual input slot and the output trays allows you to pull open the front of the printer to access the toner cartridge for replacement. 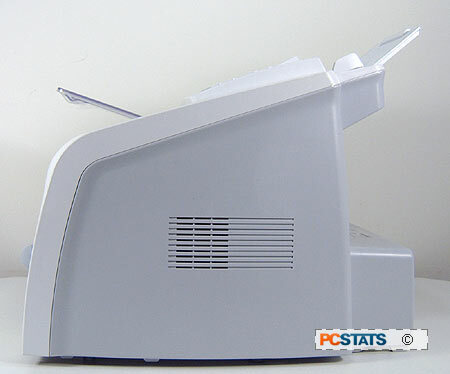 The left side of the printer holds only the handset and cradle. This is a nice feature to see on a midrange MFP like the SF-565P though. 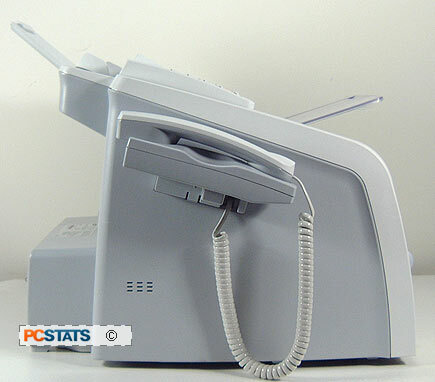 Too many fax-capable MFPs do not include the handset, which unnecessarily restricts the functionality. If you are going to hook your printer/fax device up to a landline, you might as well be able to make calls through it too. The Right side of the SF-565P is also featureless except for a ventilation port. This is backed by an exhaust fan active only during printing. The printer should not be placed directly beside a wall on the right side for this reason.